A newly established military training academy is designed to produce officers for the Afghan National Army (ANA). It is located just northeast of Kabul, Afghanistan in an area referred to as Qargha. The school, funded with 75m pounds of British money, turns out soldiers for the Afghan National Army. As the Coalition draws down its forces in Afghanistan it will still provide trainers, mentors, and advisors to some of the ANSF training institutions. This includes trainers from the United Kingdom. The school is referred to informally as "Sandhurst in the Sand". The cadet school is modelled on The Royal Military Academy Sandhurst in the UK and will likely be the only sizeable presence of British military in the years to come in Afghanistan . . . other than the odd SAS dude running around the countryside. In July 2012 the United Kingdom announced that it had formalized an agreement to provide trainers, mentors, and advisors to the Afghan National Army Officer Academy. 2. Afghan National Security University. Reportedly, the ANA-OA is part of a larger military training institution which contains the National Military Academy (NMA), the Afghan National Army Officer Academy (ANA-OA), and the Non-Commissioned Officer (NCO) Academy. 1. Australian Trainers. There are some who would like to see the ANA Officer Academy dubbed 'Duntroon in the Desert' after the Australian military academy. However, this is unlikey as the majority of the instructors and money provided will be from the UK. 3. British Funding. The United Kingdom has pledged to provide over 75m pounds over the next ten years. 4. Certainly providing the ANA a chance to build from the top down a solid officer corps. November 24, 2017. Mentoring at the Afghan Officers Academy, Resolute Support HQs, YouTube.com. A British Army Officer describes his job at the ANA OA in this 2-min long video. February 29, 2016. Graduation at the Afghan National Army Officers Academy, a 2-minute long video posted by Resolute Support Hqs on Youtube. February 17, 2015. Training Afghan Army Officers (NATO and Afghanistan), NATO. Posted on YouTube. The next generation of Afghan army officers are being forged in a rigorous training camp near Kabul, which aims to produce men and women of the highest calibre to lead their country in the fight against the insurgency. Christensen, Maya Mynster and Cecile Odgaard Jakobsen. "Cultural Frictions: Mentoring the Afghan Army at 'Sandhurst in the Sand', Small Wars Journal, November 19, 2015. May 11, 2017. "Testing by Thunder in Afghanistan", Australian Government Dept of Defence. Article explains how the Australian trainers put cadets through their paces at ANAOA. October 2, 2015. "Fighting the Taliban: Inside the academy where Afghan security forces are readied for battle". By Danielle Moylan, ABC.net.au, September 30, 2015. The author provides us with some good news about the academy . . . but some bad news on how well the ANA is doing against the Taliban. September 25, 2014. "Defence secretary salutes first Afghan officer cadets". Your Defense News. March 30, 2014. "75m Sandhurst in the Sand may turn to dust". The Sunday Times. November 2, 2013. "The one good thing we're leaving in Afghanistan". The Spectator. If 'Sandhurst in the Sand' succeeds, it could be a revolutionary development. October 28, 2013. "Latest green-on-blue attack involved confiscated equipment". Threat Matrix Blog on The Long War Journal. Attack wounded an Australian and New Zealand soldiers. October 27, 2013. "Insider attack mars opening of Afghanistan's Sandhurst in the Sand". The Telegraph. An Afghan wounds two NATO soldiers providing services to British-funded officer training academy outside Kabul. October 27, 2013. "Afghan officer academy opens it doors". BBC News UK. October 23, 2013. "Afghanistan's 'Sandhurst in the Sand' opens its doors". The Telegraph. March 29, 2012. "U.K. To Spearhead Effort for Afghan 'Sandhurst'". Defense News. May 15, 2011. 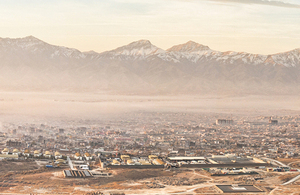 "Afghanistan's 'Sandhurst in the sand' to bring square-bashing to Kabul". The Guardian. The head of the Afghan army, General Sher Mohammad Karimi, wants officers to be trained at replica of college he hopes to build with support from Britain. 1. See an entry for the Afghan National Security University at Wikipedia. 2. See an announcement by the UK Government on the agreement to provide advisors and mentors to the ANA Officer Academy published on 19 July 2012. 3. For more on the the 'nickname' for the ANA Officer Academy see "Should it be Duntroon in the Desert"?, SBS News (Australia), September 30, 2013. 4. Source on funding 75m pounds by UK from "Sandhurst in the Sand is UK's Afghan legacy", Sky.com, May 27, 2014.